The Economic and Financial Crimes Commission Friday, arrested one Mohammed Momoh, a farmer, for attempting to defraud the governor of Nasarawa State, Alhaji Tanko Al- Makura. The suspect while posing as a “Private investigator from the Villa“ had approached the wife of the governor with a proposition to help stop a purported investigation of two accounts belonging to the governor, by the Economic and Financial Crimes Commission. He claimed he came across information regarding the two accounts that had been under investigation since 2011 and also intercepted mails and gotten wind of investigation report purportedly sent to First Bank by the EFCC. The suspect had requested for N8 million but was offered N6 million. Suspicious about the proposal, the governor’s family contacted the Commission and were asked to play along with the suspect. The suspect was arrested in a sting operation after he collected marked N2million. The suspect is presently in custody and would be charged to court as soon as investigation is concluded. In a related development, a serving Police Officer, Mohammed Nuhu Maina, has been arrested for impersonation. The suspect who claimed to be Assistant Superintendent of Police, ASP, attached to the Commission, had approached his victim with offer to help him recover his money, N21m; which is subject of investigation by the EFCC. Maina allegedly collected several sums of money from his victim before he became suspicious. The suspect called the victim on December 21, 2017 and demanded for more money. The victim immediately contacted the EFCC and he was accompanied by Operatives of the Commission who tracked Maina and arrested him opposite Rockview Hotel, close to the EFCC head office in Wuse 2, Abuja. In the course of arrest, Maina was found with EFCC Vehicle Auction Certificates, EFCC Stickers, EFCC writing pads, amongst others. “Maina is currently in custody, assisting the investigation, EFCC spokesman, Wilson Uwujaren, said. 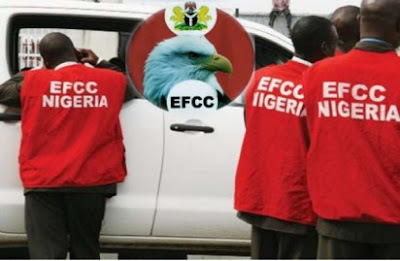 The EFCC has consistently warned members of the public to be wary of impostors who go about extorting unsuspecting members of the public. The Commission again implores the public to report any solicitation for gratification either by genuine or fake EFCC operatives to the nearest office of the Commission or police station.